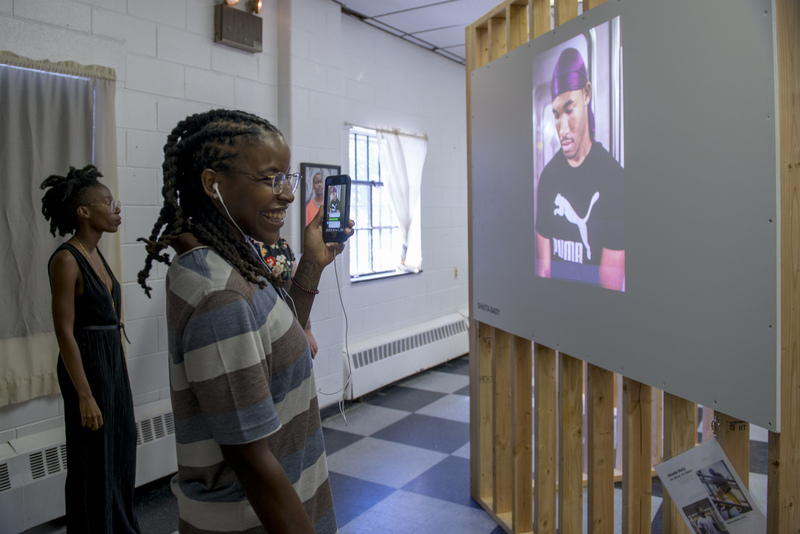 This year, the Women’s Mobile Museum (WMM), a groundbreaking residency and exhibition series presented through a partnership with globetrotting South African “visual activist” Zanele Muholi and the Philadelphia Photo Arts Center (PPAC), has been bringing a new kind of representation to Philly neighborhoods. 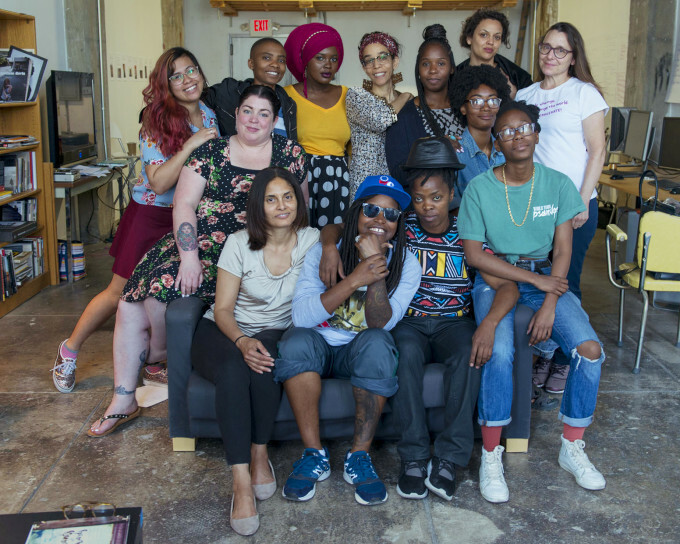 Ten local women—alongside Muholi and South African teaching artist Lindeka Qampi—who may not have had any previous experience with photography and professional exhibitions were invited to this year-long artist residency, apprenticeship program, and exhibition. They are Afaq, Shasta Bady, Davelle Barnes, Tash Billington, Iris Maldonado, Danielle Morris, Shana-Adina Roberts, Carrie-Anne Shimborski, Muffy Ashley Torres, and Andrea Walls. It’s a uniquely accessible show: inviting for wheelchair users and featuring audio and Braille throughout for people who are blind or visually impaired, along with tactile elements to evoke the images’ subjects, feelings, and compositions. The tightly curated multi-media exhibition packs an emotional punch, dealing with love, lust, and loss; caregiving and self-care; traveling and being at home; the erasure and celebration of stigmatized identities; and the trauma of assault, forced dislocations, and migration. Walls is an extensively published poet and visual artist. Living, writing, and art-making in Philadelphia, she’s always looking for “creative ways to disengage with capitalist structures, racist institutions, and all systems of oppression.” Her WMM contribution is titled North From Here: A Series of Disembodied Photographs. Viewers of Walls’s WMM work should be ready to take a bit of a forensic approach: unlike many other pieces in the series, most of her photographs do not feature a human figure. They are images set in the nearby woods and on the banks of the Schuylkill, showing things like toy plastic soldiers cast on wet river stones, abandoned shoes or clothes, and a ghost-life figure on train tracks. As a poet, Walls said, “my conceptual approach to art was already there.” She does a lot of reading, thinking, and emotional processing, and she’s especially drawn to stories of trauma. But bringing her process to the format of photography was challenging. “I have a certain amount of social reticence, to be up in someone’s face with a camera,” she admitted. “So that’s why I needed to take the bodies out of my photographs, and try to come up with something that stands in.” Sensitivity to her own and others’ pain also informed her elliptical approach. “I’m also really conscious of wanting to deal with traumas that are occurring, particularly to bodies of color, without stamping that on the bodies,” she added. Her concept for North from Here, galvanized by the crisis of separated families on our southern border, was born out of “a sense of what does it mean for a person to choose to leave home, or feel like they don’t have a home; they don’t even have a choice?” she said. They believe that when they get to their destination, things will be better. But what do they lose along the way? Some of it is just “stuff,” but some of it is their identity. 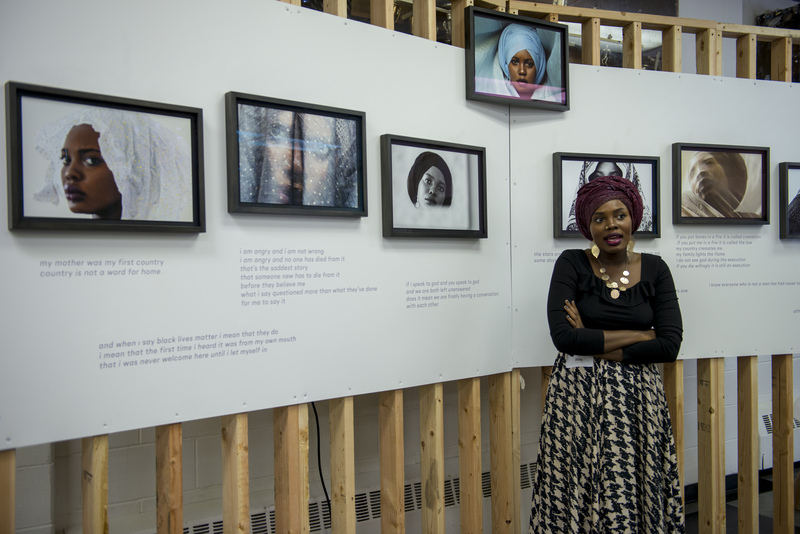 “Some of the language that was happening around people being criminalized at borders just felt very reminiscent to me of fugitive slave laws,” Walls continued. While she worked on the series, she was reading a book called In the Wake: On Blackness and Being, about “the residual experience of the Middle Passage,” the horrific journey across the Atlantic for the stolen people enslaved in America. 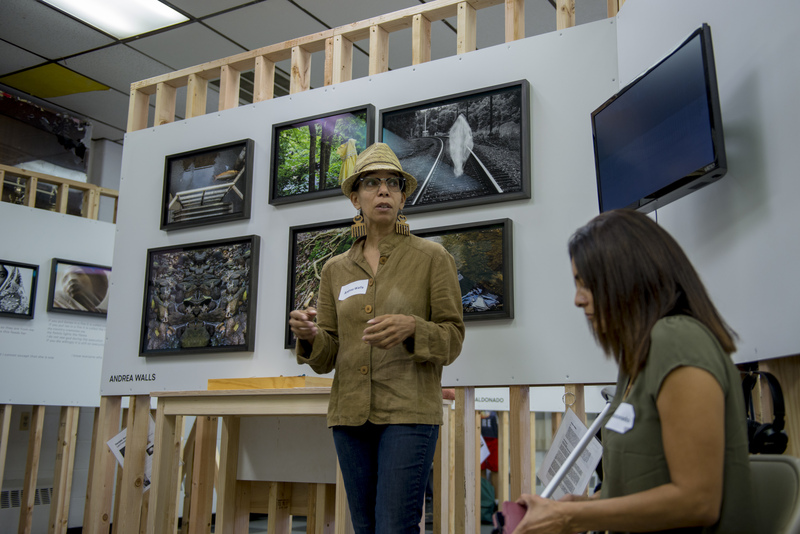 The photographic medium is new for Walls, but she looks forward to continuing with it. “Language is problematic at the moment, because people have so many hair-triggers,” she said. Communication is getting sliced down into smaller and smaller pieces, “where people are much more interested in a clever retort than nuance.” But metaphor and complexity are where her art lives, and those willing to “soak in an experience without distractions” will find something intriguing and rewarding in her imagery. 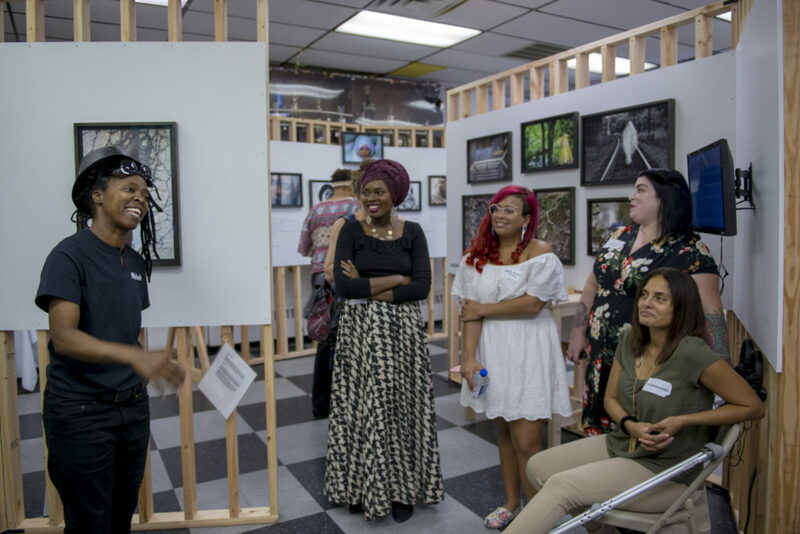 The show debuted in September at the Juniata Park Boys & Girls Club, and then moved to Point Breeze’s Dixon House through mid-November. It will move to the Pennsylvania Academy of Fine Arts for another showing, running December 22, 2018 through March 30, 2019. And the show’s culminating exhibition, featuring some previously unseen works, happens at PPAC January 24 through March 30, with an opening reception on January 24, including the launch of the WMM magazine, featuring photography, essays, interviews, and poetry.